Impart to us, O Lord, in kindness the filial devotion with which the holy brothers venerated so devoutly the Mother of God and led your people to yourself. Through our Lord Jesus Christ, your Son, who lives and reigns with you in the unity of the Holy Spirit, one God for ever and ever. Some Practical Lessons of Historical Spirituality | Basil Cole O.P. 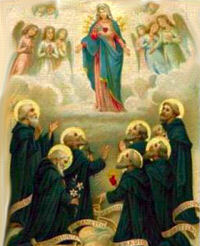 Today the liturgy honors seven noble Florentines who in the thirteenth century, at a time when Florence and all Italy was torn by civil strife, banded together to found, not far from Florence on Monte Senario, the Order of Servites of the Blessed Virgin Mary, especially dedicated to penance and meditation on the sorrows of our Lady in the passion of our Savior. This order was approved by the Holy See in 1304. One of the seven, Alexis Falconieri, died on this date in 1310. According to the 1962 Missal of St. John XXIII the Extraordinary Form of the Roman Rite this feast is celebrated on February 12. These seven men were the founders of the Servite Order, a community instituted for the special purpose of cultivating the spirit of penance and contemplating the passion of Christ and Mary's Seven Sorrows. Due to the spirit of humility cherished by the members of the Order, their accomplishments are not too widely known. But in the field of home missions great things are to their credit, and certainly they have benefited millions by arousing devotion to the Mother of Sorrows. The Breviary tells us that in the midst of the party strife during the thirteenth century, God called seven men from the nobility of Florence. In the year 1233 they met and prayed together most fervently. The Blessed Mother appeared to each of them individually and urged them to begin a more perfect life. Disregarding birth and wealth, in sackcloth under shabby and well-worn clothing they withdrew to a small building in the country. It was September 8, selected so that they might begin to live a more holy life on the very day when the Mother of God began to live her holy life. Soon after, when the seven were begging alms from door to door in the streets of Florence, they suddenly heard children's voices calling to them, "Servants of holy Mary." Among these children was St. Philip Benizi, then just five months old. Hereafter they were known by this name, first heard from the lips of children. In the course of time they retired into solitude on Monte Senario and gave themselves wholly to contemplation and penance. Leo XIII canonized the Holy Founders and introduced today's feast in 1888. With the aid of the Gospels, meditate on the Seven Sorrows of Mary: the prophecy of Simeon; the flight into Egypt; the loss of the Child Jesus in the temple; the meeting of Jesus and Mary on the Way of the Cross; the Crucifixion; the taking down of the Body of Jesus from the Cross; the burial of Jesus. Learn more about the Order of Servites at here and EWTN. The station for today is at the church dedicated to St. Augustine of Hippo. Michalangelo was one of the artists commissioned for the decoration of the church. The Renaissance façade, one of the first in this style, is built of travertine marble said to be from the ruins of the Colosseum.